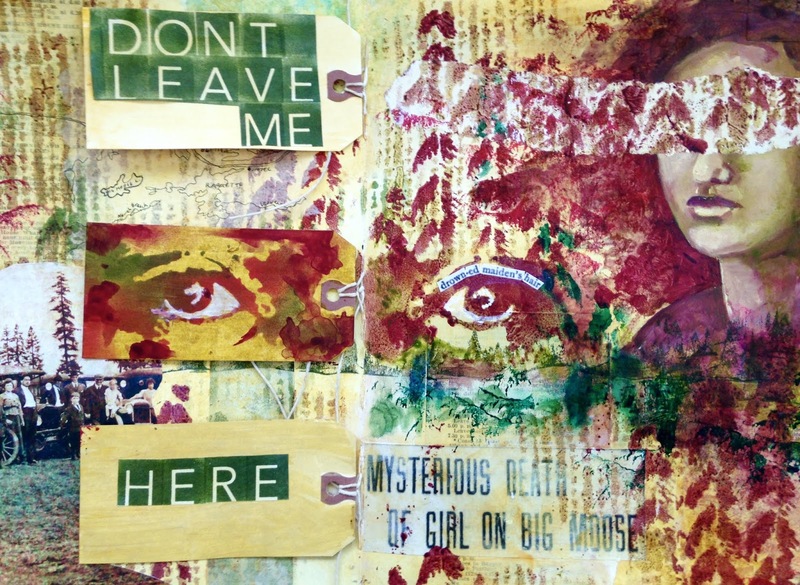 StencilGirl Talk: Collect and Collage + GIVEAWAY!! Collect and Collage + GIVEAWAY!! 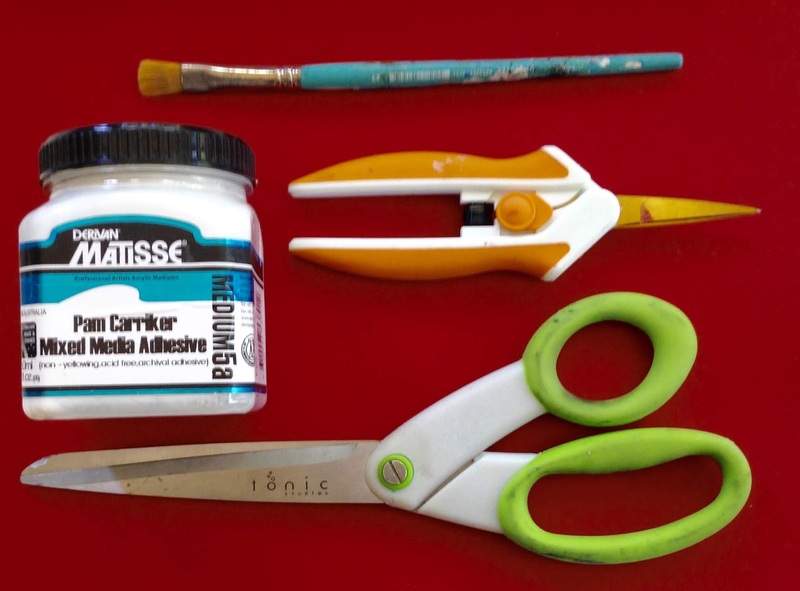 Like all mixed media artists, I have a large collection of materials and tools in my studio. “Collect” contains the Latin prefix “col”, meaning “together.” I like to gather things together and look at them and rearrange them and try them this way and that way. For a long time I collected words, and I gathered them together into stories and books. These days I gather visual imagery: I hold things up next to other things to see what they look like together. If I like how they look, I make the collection permanent, by collaging them - yes, same word origin. The interim meaning of “collage” as an art form comes via French, in which coller means to glue - in other words, to stick together. Very often, the stencils I am attracted to are ones whose imagery reminds me of something else, something that resonates with me, and I want to use that shape or texture with another bit or scrap of visual imagery and see what the effect is. 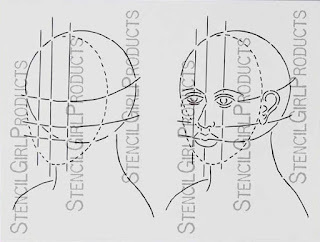 Sure, StencilGirl® stencils often have descriptive names, but as much as possible I try to separate the word from the image, and just see the shape. What does that shape look like? Have I collected something else with those lines, or that rhythm? I’ll go digging eagerly through my collections or ephemera or rubber stamps or vintage photos in search of something that - if I put it with this stencil - I may now see with fresh eyes. It tells me a new story, or maybe an old story in a new way. For this column, I have been tasked with seeing things with fresh eyes on a project that is inspired by a favorite art book. Honestly, I don’t have too many art books, but one that I have and which I refer to often for inspiration is Pam Carriker’s Art at the Speed of Life. So without question, I wanted to use an array of her stencils and masks for my project. I already had quite a few, but her new knitting textures really called to me. Then there was an art journal spread in Art at the Speed of Life that really grabbed my attention - a spread that used three manila tags in the layout. 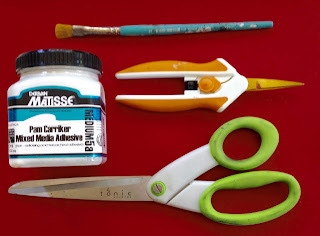 With that, I began to gather my goodies and of course, Pam Carriker stencils, masks, paints and adhesive. I wasn’t really sure where I was heading - in my mind I was playing with the words “textile” and “text,” as well as phrases that included the word “knit,” but I was doing a lot of moving things around on the page and looking for that moment of surprise to guide me. I was drawn to this vintage photo from my collection as the “eyes” of the 3/4 Face Map mask, but it was too small and drab for my purposes. I used some iPad magic to enhance the color and add more foreground so that it would work as a laser print (and this way I still have the original photo, too). 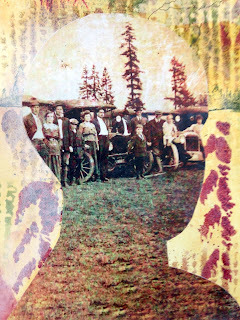 What caught my eye about the photograph, besides the intriguing long row of people, was the shapes of the evergreen trees in the background - zeroing in on that shape brought more of my collected materials and tools into focus and sent me digging for others. I had more back burner ideas about the Adirondacks Mountains (I live nearby). Like the optometrist, I kept asking, “is it better like this? or this?” “this way, or this way?” swapping out shapes and colors. I kept looking at the trees; I revisited memories of canoeing on dark Adirondack waters shaded by overhanging evergreens. Memory is the most universal collage, and we shift things around both consciously and unconsciously. Here. It is done. The infamous 1906 murder made famous by Theodore Dreiser’s An American Tragedy, on Big Moose Lake in the Adirondacks. 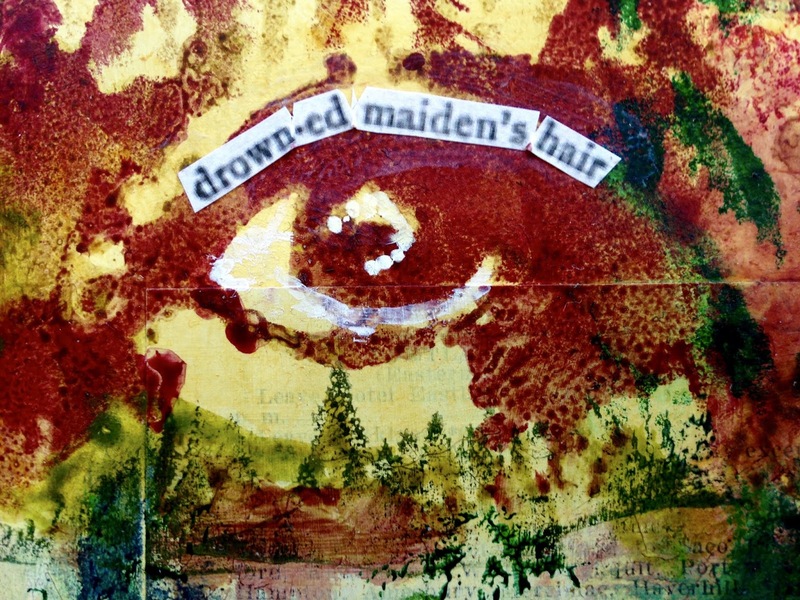 I collected all the pieces and shuffled them around until they fell into place, and then I glued them down: a drowned maiden’s hair. I wasn’t expecting to create something with a tragic story, but collage is a technique that always generates surprises, and that’s why I find it so fascinating. One lucky winner will receive their choice of $50 of Pam Carriker's stencils plus a signed copy of her book! Enter by commenting below by July 1st, 2018. One winner will be chosen at random on July 2nd. Winner notified by email. Love your work, Pam. Congratulations on the new book! Fabulous inspiring creativity . Tfs . That is awesome. I love her stencils! Love your stencils and would be great to win this book. Always looking for inspiration. drumcloc1971 (at) gmail (dot com). Wow What a cool spread and I absolutely love the way you were inspired by Pam! I will have to check out the story you referred to as I am from Upstate,NY. I love the way your colors meld so perfectly and love the way all of your elements came together- well done Jennifer! 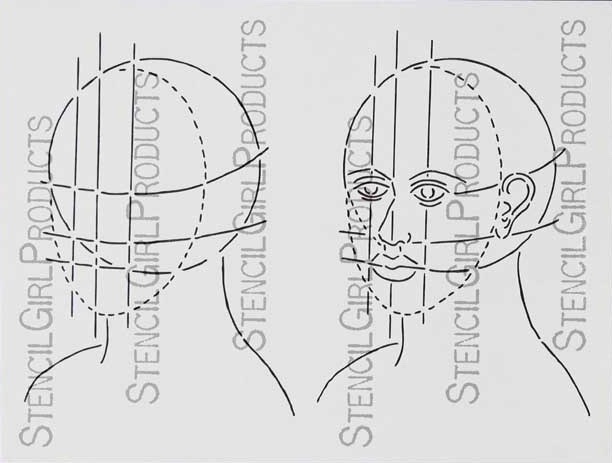 Thanks for the giveaway StencilGirl!! I like how you think! LOL I often try various items from my stash (I can't throw anything away, that can be used SOMEWHERE!) So I try to match things together from other "cast off" projects that didn't quite work together at the time but I KNOW will work with something 'one day'! Plus, I can't afford to be wasteful however, even if I could I wouldn't. Your work is wonderful and I love how you draw inspiration from other perspectives! I would love a book lie this, I could learn so much! Thanks for the chance to win that and some amazing stencils. Chilling piece. Im not familiar with the murder, but the piece leaves a haunting sensation. Love your art. Thanks for a chance to win! Great work/art! 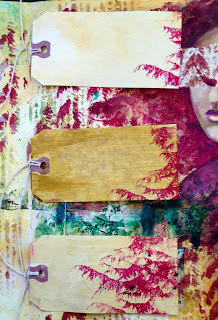 I like mixed media and especially using stencils to enhance the art. thank you for sharing your talents. I want to go back in time with your ideas and today's products so I would have years to collect and play and create. Thank you for the inspiration, Jorja Thomas-Murcia. Jorja33@gmail.com. Hi. Your stencils are beautiful. I would love a copy of your book. I Love, Love, Love, Love.. Love, Love what you have done here. Mysteriously mysterious..Collaging over her eyes really caught my attention .. spoke volumes. It amazes me how people can tell a story with their art. I Love the layering the textures and perfectly placed images, colors and bits. Thank you for the inspiration as well as a chance at a giveaway.. wish I could do collage. I may have to go look through my stencils from stencil club and grab some magazines. I don't know if I can tell a story since I haven't done collage.. But I'll enjoy making a mess. Love your collage and clever use of the stencils.Pam's stencils are one of my favourites. 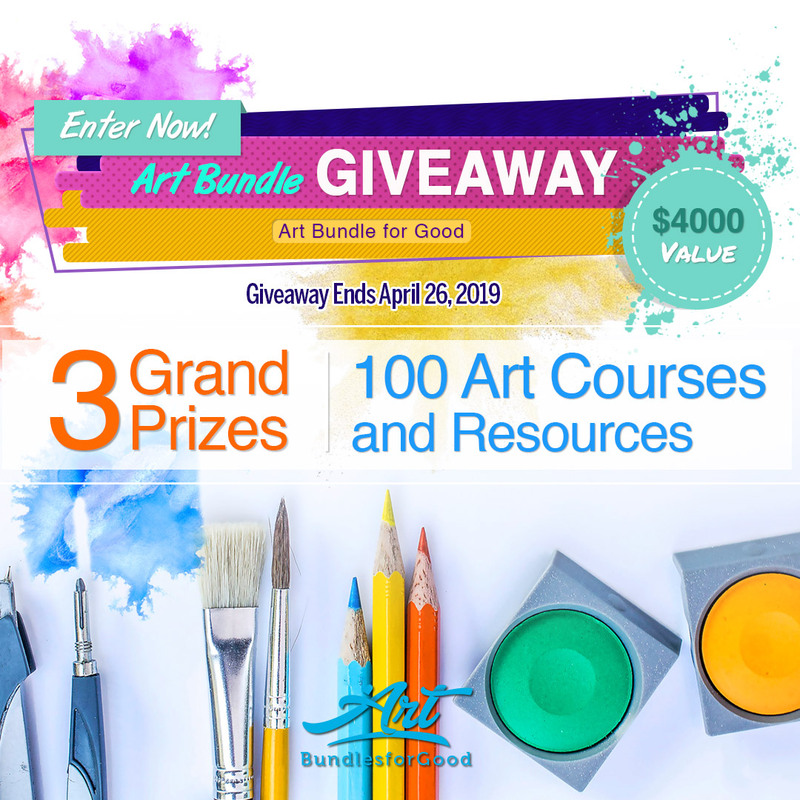 Fabulous opportunity with this giveaway! I love Pam’s creative style! I really enjoyed reading about your thought process as you created this fascinating piece! I love giveaways especially with art and books as the prize! Beautiful artwork! These stencils are very inspiring!! Thanks for the chance. Fabulous work and fun stencils. Please put my name "in the hat" for the give away. Thanks for your generosity! Beautiful! Love these and would love to win! Very creative and inspiring! Would love the chance to win. Congrats! Thank you for sharing and for the opportunity! Love your work. What an intriguing story told with great stencils! Amazing piece. Thanks for sharing your process. Love your collage work and what a great opportunity with this giveaway. Fingers crossed. Enjoyed reading your process and seeing the amazing results. Absolutely love this collage and would love to win! Thanks for the opportunity! Love the creativity! Thanks for a chance to win! Love your work. Fabulous opportunity to fun fabulous prizes. Love this! I'm definitely a collector, too! I love your books and your work, and someday I hope to have a class with you. I’d like to learn more about your style, Pam. Thanks for the giveaway offer! I love your spread Jennifer ! Didn't know that book from Pam Carriker, it's now on my shopping list ! Thank you ! Love your work! Thanks for the give away! Jennifer, Thank you for sharing your process and how a thought can lead to many pieces of art. Very interesting. I would like to see one of your pieced collages. Stencils are so fun to use. Very creative use of stencils! Would love to win. kennedy_margaret at yahoo dot com. I find the piece and the thought process behind it mesmirizing. 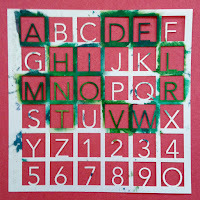 Thank you for sharing and the chance to win Pam's book/stencils! yAY!!! AWESOME THANK YOU SO MUCH FOR THE OPPORTUNITY! I'd love to try these stencils with glass! What a joy to turn on my computer today and see this giveaway! I loooove Pam and her art! I have been inspired by her Pinterest page a lot! This book seems like a homerun for her!! Wonderful art. 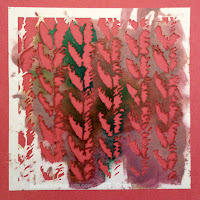 I could look at Pam Carrikers books, videos ( I wish she had more ) all day :) , art all day and such awesome stencils. This is a wonderful give away. alannahmp@gmail.com “Memory is the most universal collage.” I love this phrase and this post. 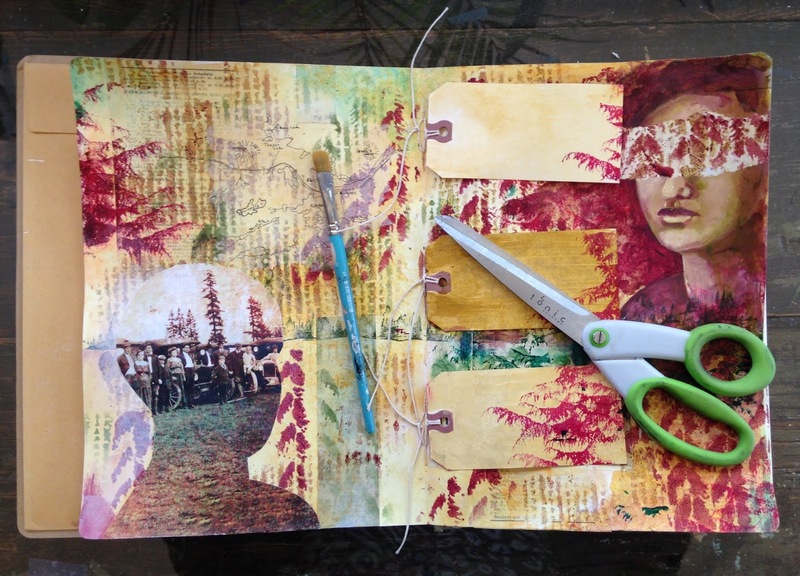 I use Art journaling in my practice as an art therapist and for my personal creative well-being. Love Pam Carriker’s work and happily own a few of her earlier stencils. I have one of Pam’s book and it is very interesting, lots of mixed media techniques to try. Thanks for a chance to win! Love Pam's fabulous art. Thanks for a chance to win. Amazing piece. Thanks for sharing your process. Have wanted this book for so long. Jennifer your visual interpretation of a story is wonderful. A great lesson on using your tools to create a story. I love Pam Carriker art supplies, I have a few....but I would love to win stencils and book!!! This post about Jennifer Armstrong...Collage...is amazing!!! I love how the project came together and how it told a story!! The stencils are are awesome also!! I would love to win the book and stencils!! Thanks for sharing!!! Your stencils are not just the same old stuff I keep seeing elsewhere. I like unique! Those are beautiful! I love them. dlatany at gmail dot com. WOW your process is fascinating. Your outcome amazing. Love how you flipped stencil to mimic the evergreens! Beautiful! Great prizes as always! Love Pam’s art and stencils! Thank you. 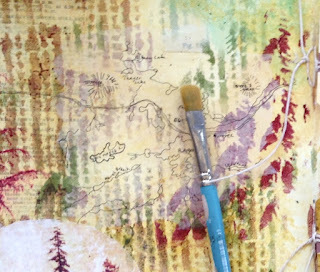 Beautiful project, and I love Pam's stencils! Thanks for the chance to win! Wonderful article! Love the project and always love stencils. Thanks for the chance to win more! Looks like an excellent set of stencils and guide book! Anytime I can be creative and do something unique and original, this is something I'd love to try. Very cool use of Pam’s stencils - yikes! Love her art! Looks like a great book and set of stencils. Thanks for the chance to win some of your great stencils! Honestly,I never won anything and don't expect to now but I still appreciate the chance! Wonderful and awe inspiring work. Thanks for a fresh perspective! Had the distinct pleasure of attending a class in Maryland with Pam and MaryBeth several years ago. Pam’s stencils make my art conversation pieces. Would love to win this one!! Thanks for the giveaway! I have checked out Pam's books over and over again from the library. It would be nice to have my own personal copy! Wow I love how your spread tells a story. It is so cool. The way you used the stencils to create texture and add interest is cool. I love it. Once I discovered Pam and her style I have never looked back..A standard to build on,her work is timeless,fun and some times strange...yet unique. ..A signed book would indeed be the icing on the cake. . Thank you for the opportunity to win. Congratulations on your book. I have a bunch of Pam's stencils on my wish list, so putting my hat in the ring for this is a no brainer :) I'll have to bring the book to the road show for an autograph if I win it! Great stencils! I love Pam’s work, her book looks inspiring. Thanks for the opportunity. Oh my I would love to be lucky enough to win this wonderful prize. The draw is on my Husband's birthday. What a great gift for him to give me. Love the stencils. Would love the book too. I love your stencils and a chance to win.Thank you!This is so fun!!! One can never have too many stencils! I would enjoy the book as well. I would love to win this giveaway great prizes! I love collage and stencils! It’s so inspiring to see other people’s work and makes me want to get out my art stuff and work! Love it!! Absolutely fantastic art! Very inspiring--thank you for sharing! I am so enamored by these stencils and the stories you can tell using them. I need more! Thanks for all your creativity and your sharing. Congratulations on your new book! Thanks for sharing. Love how you let your imagination lead you. Yes! I love seeing your process, and especially the comparison to being at the optometrist! Love your work and stencils. Keep them coming. pam carriker is one of my fave artists! Love her style, and how she has helped me draw portraits better. I love Pam's work, her book, DVD and lots of her stencils. 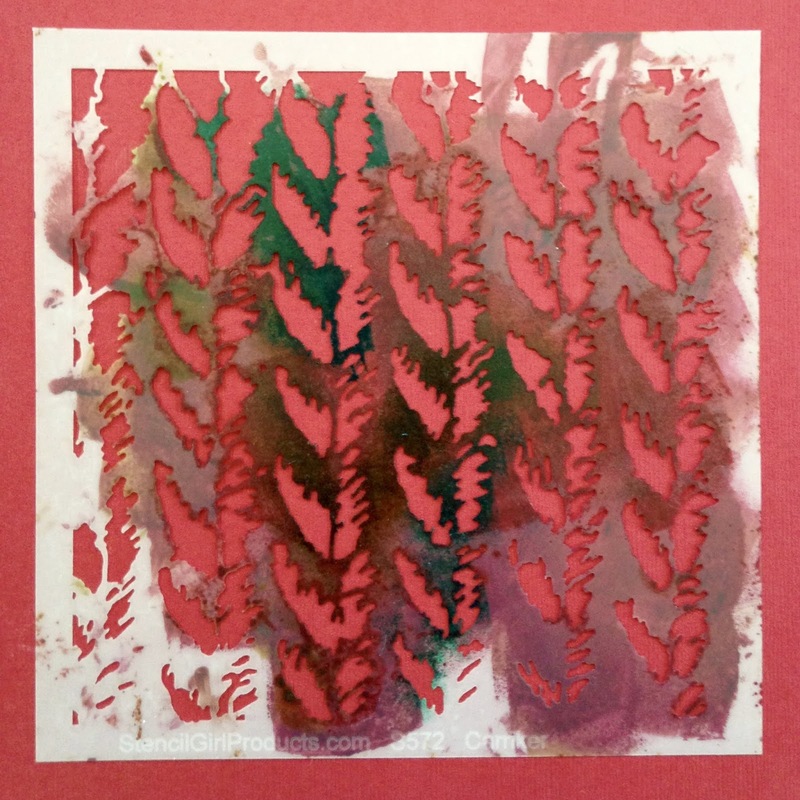 I like to use model paste through the angel wings stencil on heavy water colour paper for Christmas projects. Thank you, Pam, for sharing your knowledge, tools and artistic vision! I love Pam Carriker's work and designs!! Thanks for this wonderful post, I love what you've done with the eyes especially. 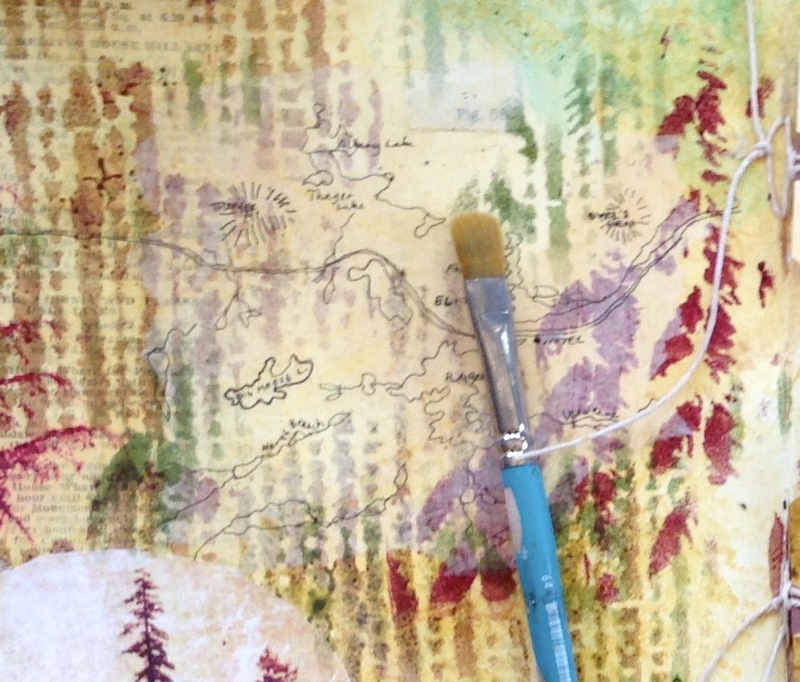 You never know when inspiration will strike, but these stencils are a hit every time! I refer to Pam’s book often but had no idea she’s expanded her stencil collection. Thanks for the stepped-out process pics! 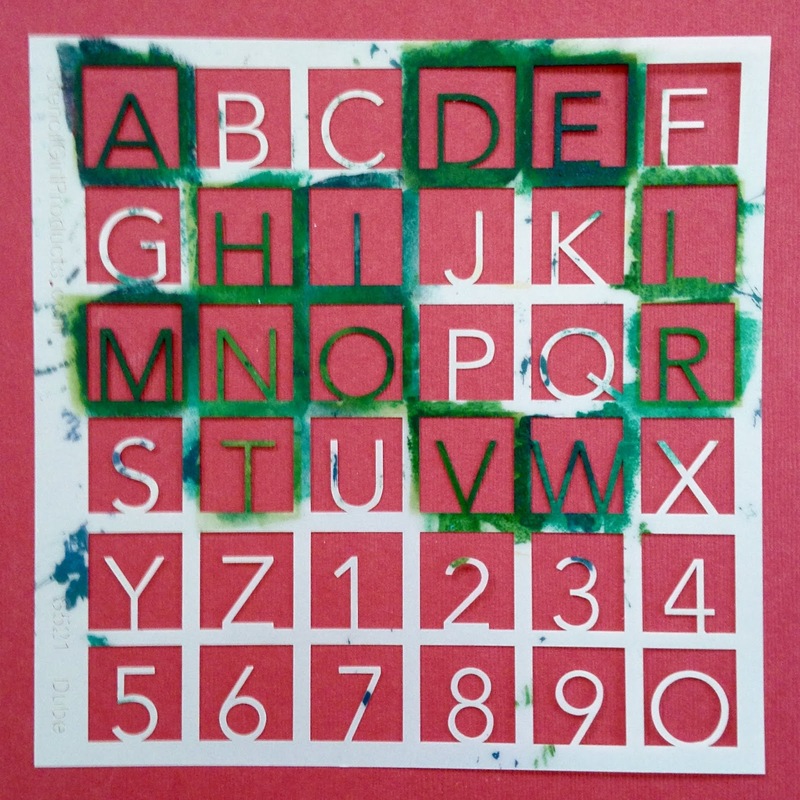 You think you have exhausted all you can do with stencil then you discover Pam Carriker's new ideas and stencils. Love your work Pam! I have followed you for several years now. YOu are a true inspiration on multiple levels! 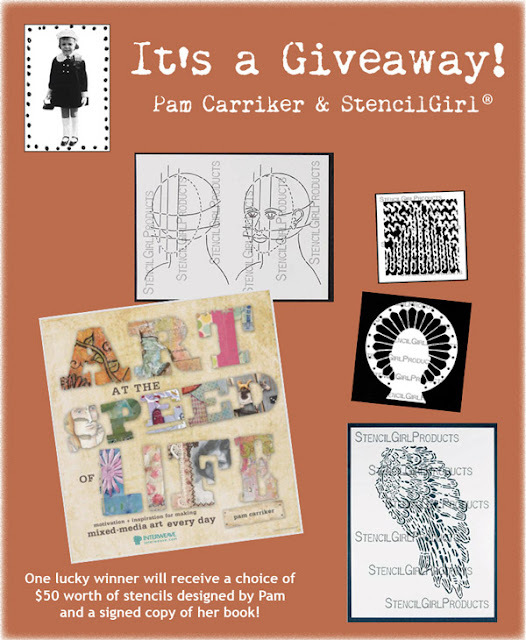 I would be thrilled to win stencils by Pam Carriker and her book. I love her designs. Out of tragedy emerges something with a message and beauty all its own. Your stencils make my artwork shine!